Archerfish are relatively small fish typically 10–20 cm in length – although they have been known to reach 40 cm – and they can spit accurately as far as ten times their body length. In keeping with their name, their bodies are shaped like an arrowhead, and most have vertical black bars and spots along their sides. They are typically found swimming in small schools just below the surface along the shores of rivers, lakes and estuaries looking for unwary insects on leaves and branches along the water’s edge. There are seven species in the archerfish family (Toxotidae), and they all have this extraordinary spitting ability. They are found throughout the Indo Pacific, from Ernakulam, India, in the East to the western tip of Papua New Guinea in the west, and from Bangladesh in the north to Alice Springs in the south. Four of the seven species are found in Australia, including one (Toxotes kimberleyensis) that is only found in the Kimberley watershed. The other three are the primitive archerfish (T. lorentzi), the large-scale archerfish (T. chatareus) and the banded archerfish (T. jaculatrix). The large-scale and banded archerfish are the most common species, and the ones you are most likely to see in your local pet store. The remaining three species (T. blythi, T. oligolepis and T. microlepis) are rarer and restricted in distribution to Burma, Indonesia and Borneo. The mangroves and rivers that archerfish inhabit are often murky, with visibility limited to only a few centimetres. It is possible that this may explain why they have adapted their hunting technique to include looking for prey above the water, because by keeping their eyes just below the surface they could take advantage of the transparency of air to see insects further away. Because olfactory and auditory cues do not cross the air–water boundary very well, insects above the water cannot smell or hear the archerfish approaching from below. To decrease the chances of being seen, archerfish are brownish–grey dorsally, which provides excellent camouflage against the murky water when viewed from above. However, the limited transmission of olfactory and auditory cues across the air–water interface means that archerfish must depend entirely on vision to find their aerial prey. Their habit of swimming right at the surface puts the archerfish in a precarious position. While their camouflage is relatively good for sneaking up on insects with relatively poor visual acuity, it is not good enough to escape the keen eyes of birds. And because the sun and sky are always bright, archerfish shadows are easily seen as high contrast silhouettes by larger fish predators below. The threat of predation from above and below is all the more reason for the archerfish to have well-adapted vision. So how do archerfish spit? Simple really... they open their mouths and gill covers (opercula) to bring water into their mouth and branchial cavity. Then they close their opercula and rapidly compress their lower jaw, forcing water between their tongue and the roof of their mouth. The water passes through a gap in two tiny flaps at the tip of their mouth. Aiming is accomplished by changing the angle of their whole body in the water. For a long time creationists used the archerfish as a flagship species, because archerfish spitting seemed to defy the logic of evolutionary theories. Their reasoning was that evolution depends on the accumulation of small changes that each convey some selective advantage to the species, so how could a fish go from not spitting to spitting far enough to hit a target when the intermediary stages would not be advantageous? What good is spitting a little bit if it doesn’t help you catch your lunch? It turns out there are intermediate stages between spitting at aerial targets and not spitting at all. Archerfish live in mangroves and along the edges of rivers and lakes, where leaves often fall in the water. Without hands it is very difficult to turn over leaves to look for small prey hiding beneath, and if they were to use their tail fins to stir up the leaves their prey would be gone before they turned around. 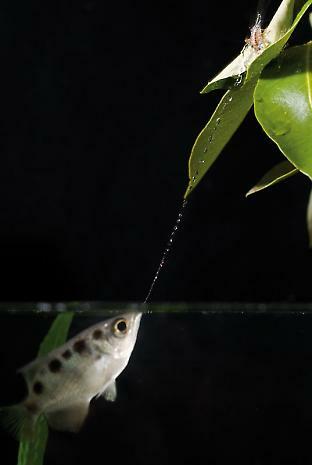 So archerfish spit water to move leaves and other debris to uncover aquatic prey. It is not hard to imagine how a moving insect on a branch above the water might attract a fish that can spit underwater to try spitting out of water too. Any fish that were able to spit in air would have a whole new food resource available to them, undoubtedly leading to greater fitness. Evidence for this line of thinking exists in other fish that can spit, though not as well as archerfish. The dwarf gourami (Colisa lalia) spits at small insects above the water, but it can only spit a couple of centimetres, and instead of shooting an accurate narrow jet it spits a large fat droplet that is probably a compensation for poor accuracy. So the fact that archerfish can spit is really not so amazing, but what is amazing is that they can do it so accurately. It doesn’t sound so hard, but consider this. When light passes through media of different densities, like air and water, it changes speed, travelling slower in denser media. Because light travels as a series of waves, when the front of the wave first crosses from air to water the edge of the wave is slowed down and redirected, causing the light to bend. This is called refraction, and it occurs when light passes between media with different refractive indices. The result is that light entering the water from the air at any angle other than perpendicular to the surface is bent. The farther away from the perpendicular, the greater the bending (refraction), such that the entire 180° hemisphere of the aerial world is compressed into a cone with a cross-sectional angle of 97.2° in freshwater. This effect is called Snell’s window. The effect on vision from underwater is that not only do objects above the water look smaller and further away than they actually are, but the image of an object above the water appears higher than the object itself. One way to avoid refraction is to spit from directly below, but archerfish don’t do that. In fact, they can spit accurately at angles from 45° to 110°, but they must rotate their whole body accordingly. Being able to spit at angles away from 90° allows them to get prey that are directly on top of horizontal branches. If given the choice, and with no obstructions, their preferred angle of spitting is about 75°. The effect of refraction at this angle causes the image of the target to appear 5° higher than it actually is, and would cause the archerfish to overshoot if it could not correct. But they rarely miss! And it is not because they watch where their previous spit went and correct it, because archerfish are as likely to hit their target on their first spit as on any successive spits. So how do they do it? Archerfish have a special area on their retina that gives them high spatial resolving power where the cone photo-receptors that are used for daylight vision are packed at a density of 50,000/mm2. This is much higher than the rest of the retina, where cones densities are only 5000/mm2. To keep the target fixed on this area of the retina, they keep their eye still as they rotate their bodies to adjust where the spit will go. But exactly how they know how far to rotate their bodies to correct for the refraction we simply don’t know. Another interesting feature of the archerfish eye is that the colours of light to which they are sensitive are different in different regions of the retina. The region of the retina that has high spatial resolving power and that is lined up with the spitting image upwards and in front of the fish has three cone visual pigments – just like us. Humans have three cone visual pigments that are maximally sensitive to blue (420 nm), green (533 nm) and red (564 nm) wavelengths. These give us trichromatic colour vision. In the lower retina, where the spitting image lands, the archerfish has cone visual pigments at 453 nm, 535 nm and 565 nm. Calculations have shown that these three pigments in humans and other primates are suited to detecting fruit against a background of foliage. Finding insects against foliage is not so different. In the rest of the lower retina that looks up and behind the fish, the archerfish has only two cone visual pigments that are maximally sensitive to 500 nm and 620 nm wavelengths. These two pigments are optimally suited to detecting the silhouette of birds against the blue sky. In the upper retina that looks down and into the water below the fish, the archerfish again has only two pigments that are maximally sensitive to 453 nm and 570 nm. These two pigments are optimally suited to detecting bright or dark objects approaching from below in the murky brownish waters. Having three different areas of the retina, each sensitive to different spectral light environments, gives the archerfish highly specialised vision for living at the interface between aerial and aquatic worlds. With a high density of photo-receptors in line with the spitting image, and trichromatic colour vision in this area of the retina, these sharp shooters are deadly predators to unwary insects. Shelby Temple is a Postdoctoral Fellow in the School of Biomedical Sciences at The University of Queensland.